Sassuolo lost Kevin-Prince Boateng to Barcelona this week, so look to Khouma Babacar against disappointing Cagliari. With a very positive start of the season, Roberto De Zebri’s men will look to bring end to an undesirable period of recent form. After a decent point won against Inter at San Siro last Saturday, they will have a chance against Cagliari to end their five-game winless run. They are currently 12th in the league table, just six points behind Lazio and the European places. Last time the two teams met in Sardinia, it ended with an exceptional drama with Boateng equalising 2-2 from the penalty spot nine minutes into stoppages. Boateng has started his new life in Barcelona, so Babacar takes over in attack with Domenico Berardi and Filip Djuricic. Federico Di Francesco, Marlon and Alfred Duncan are on the treatment table, while creative midfielder Stefano Sensi is suspended. Cagliari will have a difficult task to win only the second game away from home this season. Defender Ragnar Klavan had surgery this week on his Achilles tendon, joining Lucas Castro as a long-term absentee, while Alberto Cerri and Marco Andreolli require fitness tests. Leonardo Pavoletti tends to find the net when fit and is getting more support now from Valter Birsa and Joao Pedro. Cagliari have never won a Serie A game at the Mapei Stadium, emerging with three draws and a 6-2 defeat. Fabio Quagliarella attempts to make history for Sampdoria and could do it against his former club, struggling Udinese. The veteran hitman turns 36 next week, yet he has scored in each of his last 10 Serie A appearances. If he is on target again this weekend, he’ll equal the all-time record set by Gabriel Batistuta for Fiorentina in 1994. The only other player to have ever reached 10 was Ezio Pascutti for Bologna in 1962, so to achieve this at his age makes it an even more remarkable statistic. Despite Quagliarella’s exploits, the Samp juggernaut has slowed down recently after a run of three consecutive victories, as they lost to leaders Juventus and were held in a 3-3 thriller by 10-man Fiorentina. There was further tension in Marco Giampaolo’s side when Gianluca Caprari fractured his fibula during a training session, ruling him out for several weeks. That could well mean scrapping the plan to sell Dawid Kownacki to Fortuna Dusseldorf. Karol Linetty is still out of action with a sprained ankle and Gaston Ramirez is suspended following his red card against Fiorentina. That means Riccardo Saponara and Gregoire Defrel are the only real options to start with Quagliarella, as Manolo Gabbiadini is still getting acclimatised following his transfer from Southampton. Udinese have been desperately disappointing this season and even the Davide Nicola effect has worn off after a strong start when he replaced Julio Velazquez. They’ve won just one of their last seven games, 2-0 against Cagliari, and lost at home to Parma. Long-term absentees Lukasz Teodorczyk, Antonin Barak, Emmanuel Badu and Samir are unavailable, while the spotlight is on Rodrigo De Paul after Inter links. Stefano Okaka scored on his debut after a transfer from Watford and is battling Kevin Lasagna and Marco D’Alessandro for a starting spot. Ignacio Pussetto also returns from suspension to boost Nicola’s options. Udinese have won only one of their last 13 top flight trips to Sampdoria, failing to score in six of them. Their tally here was six draws and six losses. Krzysztof Piatek could get his Milan debut against a Napoli side who welcome back Lorenzo Insigne and Kalidou Koulibaly. Both sides enter this match off the back of a win, with the Partenopei securing an impressive 2-1 victory over Lazio considering the players that were absent, and Milan conquering Genoa 2-0 at Marassi. Milan managed to bounce back in a great way following their controversial loss to Juventus in the Supercoppa. Gennaro Gattuso’s men traveled to the Stadio Luigi Ferraris and shut out a Genoa side that is no stranger to causing trouble for some of Italy’s clubs. Fabio Borini and Suso provided the goals for Milan, whereas Gonzalo Higuain didn’t feature because he was already focused on the move to Chelsea. Higuain has now reunited with his former Napoli Coach Maurizio Sarri, under whom he became arguably the best striker in Serie A with a record-setting 36-goal season. The Rossoneri ensured that the rest of the league were aware of their intentions to compete by bringing in the Polish gunman, Piatek. Serie A’s second-leading goalscorer is set to debut against a Napoli side determined to stay within reach of La Vecchia Signora. It is likely that Piatek will start from the bench, as Patrick Cutrone’s current form and knowledge of his teammates makes him an obvious choice. It is entirely possible Gattuso intends to use both strikers together in the future, but probably not right now. The good news for the Rossoneri is the return from suspension of Alessio Romagnoli, Davide Calabria and Franck Kessie, but Cristian Zapata joins Lucas Biglia, Mattia Caldara and Jack Bonaventura on the injury list. This can never be an ordinary game for Carlo Ancelotti. He spent most of his playing career at San Siro, then had 420 matches as their Coach, winning eight trophies. In their precious victory over Lazio, Napoli were without Kalidou Koulibaly, Lorenzo Insigne. Allan and Marek Hamsik. Despite not having some of his key players, Carlo Ancelotti fielded a starting 11 that proved the Azzurri have depth in their side. Jose Callejon, donning the captain’s armband in Hamsik’s absence, finally opened his account in Serie A after going the entire first half of the season without a goal. Soon after, Arkadiusz Milik increased his side’s lead to two with an absolute peach of free kick to bring his goal total to 11 in Serie A. The return of Napoli’s crucial players will be a major boost for fans of the Partenopei. Milan are Insigne’s favourite victims, having put six goals past them, and his father even got a tattoo of the celebration after a stunning strike at San Siro. With form taken into consideration, it’s hard to take Milan over Napoli. However, with the Milan side growing in confidence, not to mention the addition of Piatek, this is really a match that could go either way. Milan have won only one of their last 15 Serie A meetings with Napoli, managing five draws and nine defeats home and away. The lone stand-out was 2-0 at San Siro in December 2014. After a heavy loss on the road, Chievo will be desperately looking to get back on track as they host Fiorentina in their first home game of 2019. The Flying Donkeys had finally ended their long wait for a first win this season by narrowly beating fellow relegation candidates Frosinone 1-0 in their final game of 2018. However, the wind was firmly knocked out of their sails as they traveled to the Allianz Juventus Stadium and were promptly thrashed 3-0 by the reigning champions. In denying Cristiano Ronaldo a chance to make it a 15th goal of the season when his penalty effort was kept out by Stefano Sorrentino, Chievo managed to keep the score down somewhat, but even that was not enough to prevent the struggling side from succumbing to a heavy 3-0 defeat. Now nine points from safety, and with an appeal against their three-point penalty for financial irregularities rejected, their chances at avoiding relegation dwindle with each passing round, but certainly they will have some hope of recovering when the Viola come to town on Sunday. That is despite winning just one of the last six meetings between the two sides dating back to 2016 (which include five in Serie A, one in the Coppa Italia). Fiorentina, who are winless in their last three games, have struggled for consistency all season, which has prevented them from fully challenging for a Europa League spot. Currently in 10th place, Stefano Pioli’s side have failed to win five of their last six away games – save for a 1-0 win over Milan at San Siro – and come into this match having earned just one point from their last three Serie A fixtures overall. The hard-fought win against the Rossoneri was perhaps supposed to be a turning point for the Viola, who had then made it back-to-back wins after stumbling to a 3-3 draw with Sassuolo. However, things soon went awry once again following a surprise 1-0 home defeat to Parma, followed by a dull scoreless stalemate versus Genoa on the road to wrap up 2018. They then resumed action in 2019 with a comfortable 2-0 win over Torino, but fumbled a 2-1 lead to barely hang on for a 3-3 draw against Sampdoria in their last match. Granted, Fiorentina did have to play much of that clash with 10 men after Edimilson Fernandes saw red, but Pioli nonetheless will be very disappointed with how his side conceded two goals in less than five minutes to go from 2-1 up to 3-2 down. Will they avoid a similar frustrating result as they head to face a Chievo side desperate for points to keep their survival hopes intact? Fiorentina Coach Stefano Pioli has won just one of his last nine meetings with current Chievo boss Domenico Di Carlo (D5 L3). Will Di Carlo, who has an overall record of five wins, one draw, and five losses from his prior 11 clashes against Fiorentina, manage to get the better of his tactical counterpart once again? There could not be more at stake in this relegation dogfight between Bologna and Frosinone, as two of the bottom three go head-to-head. Both teams will be trying to pull away from bottom dwellers Chievo, while trying to close the gap on Empoli, who currently lie in the last safe place in Serie A.
Seven-time Scudetto winners Bologna have picked up just three draws in their last five games, while Frosinone have grabbed two points in the same period. Interestingly, both teams were able to hold Champions League chasing Milan. Last week, Bologna were pegged back by SPAL after taking the lead through a Rodrigo Palacio screamer, while Frosinone were thumped 5-0 by Atalanta on home turf. Bologna Coach Pippo Inzaghi has put January signings Roberto Soriano and Nicola Sansone straight into the starting XI, as well as making more use of Juventus loanee Riccardo Orsolini, and he is expected to use the more attacking line-up again, especially at home. Frosinone, on the other hand have been dealing with an off-field war of words between their President Maurizio Stirpe and Napoli owner Aurelio De Laurentiis in recent days. The outspoken moviemaker claimed that the Ciociari were “already relegated” when they gained promotion from Serie B last season, not drawing enough interest from either fans or the media, and that they should be “fined”, should they finish in last place. Stirpe did not mince his words when responding. “I’ve always invested in football and built our new stadium (which bears his name) with the TV rights money. I’d also like to say that I won’t accept advice from someone who’s won practically nothing in recent years.” This is certain to spice things up the next time those teams meet at the end of April. Meanwhile, Frosinone can focus on not finishing bottom, which is where they would be right now if not for Chievo’s three-point penalty. Bologna are without a Serie A victory in 13 rounds, managing just seven draws and six defeats, while they haven’t scored at the Dall’Ara since November. Gian Piero Gasperini’s Atalanta host Roma at the Atleti Azzurri d’Italia with both sides looking to break into the top four. The hosts currently occupy seventh place and are just two points behind Roma, who sit fifth in the table. Eusebio Di Francesco’s side are in blistering form, winning three of their last four Serie A games, scoring a combined eight goals and conceding four. Roma have also scored at least twice in six of their last seven matches, and Stephan El Shaarawy has found his scoring touch again. Meanwhile, Atalanta are unbeaten in their last three Serie A games, scoring a mammoth 13 goals in the process and conceding just four times. There have also been over two goals scored in 11 of Atalanta’s last 12 games, so expect this one to be a truly entertaining affair. Colombian forward Duvan Zapata is one of Europe’s hottest strikers at the moment, registering 14 goals this season, tied with both Cristiano Ronaldo and Fabio Quagliarella. However, Roma could lack creativity as they will be without Cengiz Under as a result of a thigh strain. The 21-year-old has been I Giallorossi’s main attacking threat this season, registering five assists and three goals in Serie A. Stephan El Shaarawy is expected to come into the side. The visitors have four players sidelined through injury with Under, Juan Jesus, Antonio Mirante and Diego Perotti all likely remain unavailable until February. A win for the home side would see them leapfrog Roma into fourth if Milan fail to beat Napoli at home on Saturday. Roma must win if they are to keep pace with Milan and create a gap between themselves and both Lazio and Atalanta. It’s added pressure before they enter their Coppa Italia Quarter-Final next week. Roma and Atalanta have faced each other a total of 26 times. With a fixture average of 3.1 goals per meeting. Parma have been a real surprise package this season, sitting in the top 10 as they host a SPAL side hovering above the drop zone. With multiple reports circulating that Omar El Kaddouri will be a Parma player on Monday, the Ducali could be doing with his creativity going into this tricky clash with the 16th placed Biancazzurri, as there appear to be knocks to key players in midfield. The Gialloblu will want to continue climbing from their credible mid-table position with another victory to take them further towards a Europa League place after two tough away wins at Fiorentina and Udinese. The form book suggests Parma should win this game at home, however SPAL are desperate for points in their relegation struggle, with four losses in their last five away league matches. Antonino Barillà has been following a personalised training plan as a result of muscle fatigue and is a doubt. Luca Rigoni and Leo Stulac have also followed individual training regimes and received treatment. Leonardo Semplici’s misfiring side have failed to score in three of their last five Serie A games, so will need former Milan youth product Andrea Petagna to add to his six-goal tally in this one. Since a shock 2-0 victory away to Roma on October 20, the Spallini have scraped only six draws from 11 rounds. Thiago Cionek is suspended in defence, but Emiliano Viviano made a solid debut in goal last week following his transfer from Sporting CP. The good news is that Manuel Lazzari has already recovered from a knock that forced him off in the 1-1 draw with Bologna. The last time SPAL visited the Stadio Tardini was a Serie C fixture in March 1986, ending 0-0, long before the Ducali had ever made their top flight debut. Inter face a tricky trip to Walter Mazzarri’s Torino and risk losing confidence after the goalless draw with Sassuolo. The Granata are also on a poor run of form lately, winning just one of their last six Serie A games, a 3-0 home victory over Empoli. Toro sit in 11th place in the table and are starting to drop away from their season objective of qualifying for the Europa League. The Turin outfit’s last two league outings have both been at the Stadio Olimpico, where a 1-1 draw with Lazio was followed up by a 3-2 loss to Roma last weekend. The Giallorossi had gone two up in the first half before a spirited comeback was spoilt by a Stephan El Shaarawy late winner. Coach Mazzarri has come under significant criticism in recent weeks with his forwards misfiring in front of goal. Toro fans should be hoping their strikers deliver the goods in this one, or their side could find themselves firmly stuck inside the bottom half of the table. Mazzarri will have to do without the services of French midfielder Soualiho Meite, who is sitting out the second game of his two-match ban after receiving a controversial red card against Lazio. Meanwhile defender Emiliano Moretti is missing through injury. The Nerazzurri have now fallen seven points behind Napoli in second, but seven clear of Roma in fifth, which gives them a bit of breathing space in the race to finish in the top four. La Beneamata have lost just once in their last eight league games, a 1-0 result away to Juventus, but are finding scoring a bit of a tough challenge. Their last outing was a goalless stalemate at home to Sassuolo, which came off the back of a fortuitous win against nine-man Napoli in the previous round. Coach Luciano Spalletti’s side have failed to score more than one goal in their last six Serie A games and the former Roma manager has his work cut out for him in trying to get his team playing a more attacking style and to not be over-reliant on captain Mauro Icardi. With just Keita Balde Diao and Sime Vrsaljko on the treatment table, Spalletti has an almost fully fit squad to pick from. Radja Nainggolan’s return means the 4-2-3-1 formation is back, with Matteo Politano and Ivan Perisic fanning out behind Icardi. Mazzarri is also shaking things up to make Toro more prolific, giving Simone Zaza and Iago Falque the role of feeding Andrea Belotti. Expect this game to be a hard-fought contest, as both teams will be desperate for the points. You would have to go back 13 games to a 2-0 away win for Inter in September 2012 to find a match where one of these sides won by a clear two-goal advantage. Inter have won just one of their last six Serie A encounters with Torino, drawing three and losing the other two, failing to keep a clean sheet throughout that run. Juventus travel to Lazio on Sunday and both teams are forced to reshuffle amid bans and injuries. However, Lazio are in desperate need of a win themselves, as last week’s 2-1 loss to Napoli along with other results saw them slip to sixth and subsequently leapfrogged by Roma in the race for fourth. A positive result in this clash would do wonders for Le Aquile and their quest for a return to Champions League football. However, it won’t come easy. Lazio have not defeated La Vecchia Signora at the Stadio Olimpico n a winless run dating back almost six years. Their last victory against Juve here came in the Coppa Italia – a 2-1 win in January 2013 thanks to a Sergio Floccari stoppage-time winner. Adding to their woes, they will have to settle for a makeshift defence, as they are missing the injured Luiz Felipe and suspended Francesco Acerbi – after the latter was sent off in last week’s loss following his second yellow card. Adam Marusic also completes the two-match ban, as he was sent off in Lazio’s 1-1 draw against Torino before the winter break. It means Wallace should take the central role in a three-man defence, while Joaquin Correa could support Ciro Immobile, giving Luis Alberto a slightly deeper starting position. Meanwhile, Juventus are flying high. They are still undefeated in the league with 18 wins and just two draws so far. 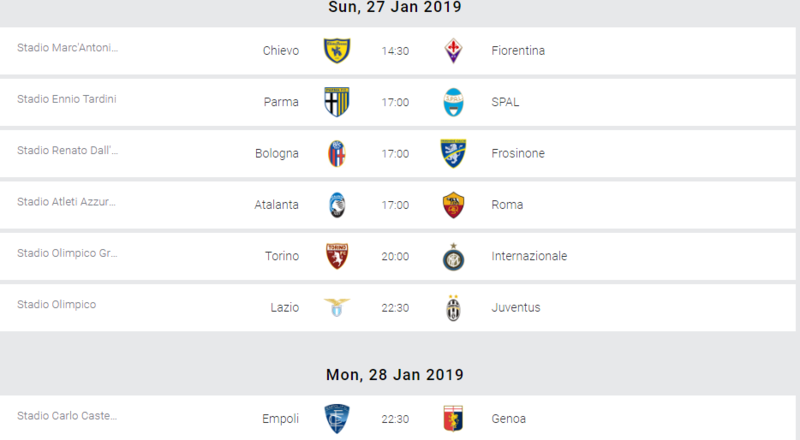 They have a nine-point cushion at the top of Serie A and this could be extended on Sunday with Napoli’s tricky trip to Milan set to be played 24 hours earlier. However, Max Allegri has an injury crisis of his own. Juan Cuadrado, Andrea Barzagli, Mario Mandzukic, Medhi Benatia, Joao Cancelo, Sami Khedira and Miralem Pjanic are all out of action. Therefore, Emre Can and Rodrigo Bentancur are set to start in the middle of the park alongside Blaise Matuidi, while Cristiano Ronaldo is expected to be flanked by Paulo Dybala and Douglas Costa. This match is set to be an intriguing one. Despite their less-than-pleasant track record against Juve, Lazio are more than capable of challenging them on Sunday in a game where the Bianconeri are so injury-hit. Lazio have only scored once in their last nine Serie A home games against Juventus, drawing one and losing eight. Only three points separate Empoli and Genoa going into Monday night’s game, as both hover above the drop zone. While the Tuscans have seen a recent surge in positive results, having recorded a drawand a win, the Grifone have been finding it hard to pick points, so expect to have a desperate, action-wrought outing between the two Serie A outsiders. Empoli will be able to draw upon the expertise of their midfielders, Rade Krunic and Ismael Bennacer, both back in the fold after serving a one-game suspension each. Striker Antonino La Gumina is working hard to spring back into action after picking up a thigh injury, so Miha Zajc is expected to step up and play instead. Genoa are getting to grips with losing top scorer Krzysztof Piatek, who joined Milan on Wednesday for €35m plus bonuses. Cesare Prandelli has not yet found a suitable replacement for his Polish striker, as negotiations continue with Juventus for Marko Pjaca, currently on loan at Fiorentina. Either Goran Pandev or Andrea Favilli are expected to slot into Piatek’s position to play 4-4-2 instead of the typical 3-5-2. Oscar Hiljemark, Sandro and new signing Stefano Sturaro are all on the treatment table. Empoli have not kept a clean sheet in 17 Serie A rounds, the longest negative streak in the current campaign. Another would match the all-time club record of 18 set from November 2005 to March 2006.